I can't believe it's already November! Are you here for the Queen Kat Designs November release previews? You should have started at the Queen Kat Designs blog, if not, hop on back there! There's lots of AWESOME new releases to see! If you are coming from the delightful Sara's blog, you are in the right place! These stamps will be available in the store starting on November 4. Isn't that exciting? My first project uses Monarch Mia. She's a mermaid that has characteristics of a butterfly. Super pretty! You can't really tell in this photo, but I did color her tail a buttery yellow color. I started coloring her and thought that she stood out more without the background colored in. You know, like those photos that are black and white with a touch of color? Next up is Lydia. She's a pretty little mermaid with jewels on her forehead and flowers on her tail. I had her colored in and I asked Dustin what color I should make her hair. He said blue. I said "are you sure? Not brown or blond." He was sure and since I asked, I went with it. The background paper here is DCWV, the flower is a Prima, and the little rhinestone is Darice. And I had my own little guest designer this week. ;) This is Brady's creation, showing that ANYONE can use QKD stamps! He was watching me while coloring in his coloring book. He tried to "help" me color so I gave him his own Lydia image to play with. I let him pick some paper scraps and some stickers to use on his card. This was the FIRST card he ever made, now he wants to make cards everyday. He comes up to me and says "CARDS!" Now, hop on over to the Queen Kat shop and pick yourself up some yummy stamps. The special right now is buy 2 stamp sets and get 1 separates for FREE or buy 3 separates and get one FREE (valued at $3.99 or less). 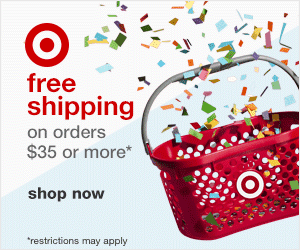 If you really want to, you can wait until Nov 4 to buy stuff. 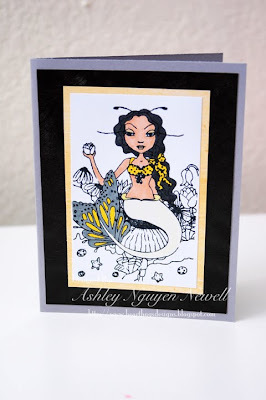 Also, if you want to WIN a FREE mermaid stamp, don't forget to enter my challenge HERE. AND don't forget to come back on Nov 19 for the AWESOME BIRTHDAY BLOG HOP AND NEW RELEASE! Gorgeous cards, love the black and white, very nice! These are both so cool! He was right on the blue hair- it looks awesome! Brady's already in craft training, huh!? It's adorable! You do some really good coloring...these are great. I like the one with the opposing panels on it. Love them all Ashley, especially Brady's. Beautiful cards!!! Brady did a great job! OH MY!! I don't know which to comment on 1st. Your genius with the touch of color, which looks awesome. Dustin with him being totally right on the blue hair, it looks perfect. And BRADY!! My man, busting out his crafting skills. Well at least he got it honest. Maybe QK can enlist Brady's help. Your cards and his are fantastic! I love the selected coloring in the first one and how precious that you used his!!! Awesome! these cards are really elegant. My son loves to color my stamped images also. Wonderful cards!! how cute is Brady's! He did a great job! That is just adorable!! Great job to you and your helper!! OOOOOOOOOOOOOOOOH i love them all!!!! I love Mia's yellow polka dot bikini - classic! And I love Lidia's blue hair and the one Brady made! So cute!!! These are all gorgeous and your guest designer is VERY talented! Feature them ALWAYS!!! So cute! Better watch out, he'll be competing against his momma for DT spots! 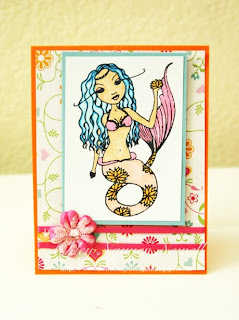 :-) Love how you colored your card! Absolutely wonderful!! Love the colors you chose, what you wrote, your son, just love it all! !